It’s been 67 years since physicist Enrico Fermi’s seemingly innocuous remark sparked the investigative drive of scientists the world over. Fermi once contemplated the possibility of life in the universe as a numbers game. With hundreds of billions of sun-like stars in our milky way alone, it seems that if planets like ours are at all commonly found, life would have arisen a number of times, and, like us, sent its signal out to the universe. We have seen no such signal, and this Great Silence has fascinated researchers ever since, especially as the search for planets like Earth proves particularly elusive. It wasn’t until decades after Fermi’s death that our cosmic loneliness began to lift with the discovery of the first extra-solar planet. The last decades of planet hunting have since unearthed thousands of extra-solar planets with diversity in masses, orbits, and host stars beyond what was ever expected. From the first planet unexpectedly found orbiting a dead, violent stellar remnant known as a pulsar, to planet 51 Pegasi b — a planet the size of Jupiter which orbits close to its star — the early years of exoplanets showed that our galactic neighborhood was a strange place, full of unexpected worlds. These new solar systems shattered our fragile theories of planetary formation, previously built on a sample size of one. Looking out into the night sky peppered with stars, astrophysicists see millions of suns, each one with its own system of planets — potentially planets similar to our own. In their January 2017 article “Exoplanetary detection by multi-fractal analysis” Yale researchers used noise as another piece of information, and championed a unique mathematical approach based on multi-fractal analysis to sift through noise in spectral data to pinpoint potential exoplanets – even in astonishingly noisy data sets. This will further the conditions in which we can search for exoplanets. Planets are hard to see. They are small, dim, faraway, and easily lost in the glare of light from their star. This makes their direct detection difficult, especially for the tiny earth-like planets, which no longer glow with heat from their formation. For these reasons, planets were first discovered indirectly, their presence indicated by their influence on the light of their host star. When a planet orbits a sun, the sun orbits the planet as well, both moving about a mutual center of mass. Since the star is far more massive, that point lies inside the star, making it appear to wobble – its light shifts blue as it moves toward us, and red as it moves away via the Doppler effect. With knowledge emboldened by our physical model of gravity and the laws of Kepler, researchers can fit the signal of a planet to this periodic oscillation using a method we call Doppler spectroscopy. But for the smallest planets, like Earth, it’s not that simple. Unable to tug at their stars as strongly as commanding gas giants like Jupiter, their low mass creates only a small signal; a miniscule ten-centimeter per second shift for the star. This is the cutting edge of the detection capability for next generation instruments. In addition to this challenge of instrumental noise, the spectra of stars are marred by time varying signals imposed on their light by our atmosphere. Finally, and perhaps most challengingly, planet-hunters must reckon with the astrophysical conditions of the stars, since planets aren’t the only phenomena that can induce periodic variations on starlight. Stars can do that all by themselves. For all their twinkling, we tend to think of stars as relatively constant points of light, but they actually are broiling cauldrons of plasma prone to spectral variations These signals can mask, or more problematically, mimic the presence of an exoplanet. But despite all of the exoplanets discovered thus far, earths have remained elusive, and we’ve never been able to discover such a planet, or detect any world with that elusive ten-centimeter per second signal generated by a planet with Earth’s mass and distance from the sun. Parameter space of discovered exoplanets, colored by method of discovery, where radial velocity is the method explored by multifractal analysis. Some solar system planets added for reference, and Earth’s location is indicated by the rainbow sticker. Dotted lines added to indicate the approximate radial velocity signal. It’s clear that .1 meter per second signals are outside of what has currently been detected. Earths as we know them are as yet unseen. Original image courtesy of NASA. Modifications by author. With so many timescales of noise of so many different types, it’s difficult to find tiny planetary signals. Some scientists try to fit models of stellar activity, atmospheric signatures, and planetary motion to the data. Unfortunately, using so many free parameters produces high uncertainty. In addition to this high uncertainty, the mechanisms of stellar activity aren’t precisely well characterized or well suited to observation. There’s no way to resolve the surface of the star as we take spectra, and thus no way to absolutely take out the activity signatures with certainty. Still other scientists do their best with the data, trying to only search for planets around “quiet” stars, and only then checking to determine whether than “planet” might be the remnant of noise. But there is one branch of mathematics particularly suited to chaos and noise. Benoit Mandelbrot, known as the father of fractal geometry, worked at Yale developing this field as the Sterling Professor of Mathematics until his retirement in 2004. His innovations managed to wrangle nature in the way it exists, distilling the jagged complexities of coastlines, galaxies, markets, and the human cardiovascular system into a beautifully defined mathematical formulation. A decade after Mandelbrot’s death, John Wettlaufer, A.M. Bateman Professor of Geophysics, Mathematics and Physics at Yale has taken up the mantle of exploring and applying this chaotic mathematics, but with an added layer of complexity. 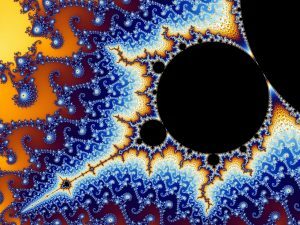 Multifractals are fractals that themselves exhibit fractal behavior. Not as easily recognizable as their simple repeating counterparts, these objects exhibit self-similarity on many scales of time and space, with rules that apply differently at different levels. Even the rules themselves are fractal! The complexity of multifractals is well suited for exoplanet data, leading to new modes of searching for exoplanets. This depicts the Mandlebrot’s notorious and eponymous fractal set, which illustrates geometrically the self similar properties at various spatial scales, present also on multiple time scales within the multifractal formulation used by the researchers. Image courtesy of Wikimedia. Professor Wettlaufer doesn’t like making assumptions. With a background in research on the geophysics of arctic sea ice, he realizes that scientists can so easily get carried away with models replete with unspecified parameters, and have too much with extrapolation. Scientists will often take data on something like arctic ice melting, see the downward trend, fit a line and extrapolate that in 2040, there will be no ice left. That thinking is problematic. Taking data on 100-meter sprint times, he could just as easily fit the trend and extrapolate that if we wait long enough, people will run at the speed of light, which is impossible. Noise is a part of life, a part that can help scientists predict the signals, and their future. In the labs of other fields, noise can be suppressed, but in the context of systems as large as the earth or the universe itself, such control is impossible. Noise is something that must be embraced in all its complexity to recover any underlying process. In the noisy data, he believes there are underlying principles to be understood, but Wettlaufer refuses to assume that he knows what they are by imposing his own assumptions onto the data. “It’s an ill-posed inverse problem,” Wettlaufer explains, “nature has produced the solution for you. And now what? How did we get there?” When researchers take measurements of a star, they don’t see the surface features that create noise, measure tiny blemishes on the star, or plot the motion and characterization of every single atmospheric particle that contaminates the data, and they can’t directly observe the planets as they move around. It’s the sum of all these effects that generate the data received. Researchers are blind to everything but the data that results from everything combined, so the objective is to work backward to reconstruct the planets. Using the mathematics of multifractals, Wettlaufer and his team, mathematics graduate student Sahil Agarwal GRD ’19 and Fabio Del Sordo, a postdoctoral fellow in Geology & Geophysics, took a step back and let the data do the talking in a recent paper. Applying a method called Multi-fractal temporally weighted detrended fluctuation analysis (MF-TWDFA, for short), the team was able to probe the data for multi-fractal behavior, looking for self-similarity, or resemblances within sets of data, to determine which are the most important. Instead of fitting the data to just any polynomial, the team posited that signals closer together in time were more likely to be correlated, as measurements taken closer together in time are more likely to be close for a given “rule” which governs any specific process. This allows for the characterization of noise. For instance, El Niño Southern Oscillation has a white noise structure, whereas this method reveals that the change in arctic sea ice has white noise, but on a year timescale. The team’s recently accepted paper in Scientific Reports looks at the stability of these processes for exoplanets and sea ice data, since stability and instability are of paramount importance in climate systems, and also in exoplanets, where unstable orbits are known to occur. Together, the team was able to recover the same planetary signals the astronomical community had come to a consensus upon for known planetary systems – and they then proceeded to push their method to the limits. Simulating data from a planet and star marred with terrible signal to noise, their method was still able to recover strong, accurate, planetary signals embedded in their analysis, with worse data than anyone in exoplanets can currently use. This experimental method will be further tested by Wettlaufer and his team and applied to an immense set of exoplanet data through a new partnership with Michel Mayor and Didier Queloz, co-discoverers of the first exoplanet. Using noise to differentiate signals, they will refine and compare their method with typical approaches used by others in the data consortium on a large scale. For exoplanets, they’d like to eventually deliver an algorithm to implement during observations, which could help decipher signals in time for meaning. They also speculated on the many possibilities promised by their time-conscious multi-fractal method — including better market predictions and further application to environmental problems. Making no assumptions. Removing no information. With techniques like MF-TWDFA, it seems that Fermi’s Great Silence is giving way to beautiful, meaningful noise. About the Author: Sophia Sánchez-Maes is a sophomore Intensive Physics and Astrophysics double major in Timothy Dwight College. She is co-president of Yale’s Society of Physics Students, and has worked on / is working on research with Professors Jun Korenaga, Gregory Laughlin, and Debra Fischer, as well as Dr. Fabio Del Sorto. Recommended Reading: Agarwal, Sahil, Fabio Del Sordo, and John S. Wettlaufer. 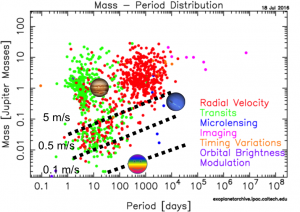 “Exoplanetary Detection By Multifractal Spectral Analysis.” The Astronomical Journal 153, no. 12 (2017): 12pp. Cover Image: Exo-Earths, with their minuscule 10cm/sec radial velocity signal, are among the most difficult planets to find. This artist’s concept features Kepler 186f, a possible Earth-size planet in the habitable zone of its star. Image courtesy of NASA.